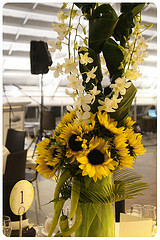 Tall wedding centerpieces look stunning, they create a wow when you walk into the room and they look expensive! But the good news is that they don't have to be over your budget, and you can put them together yourself to save even more money. 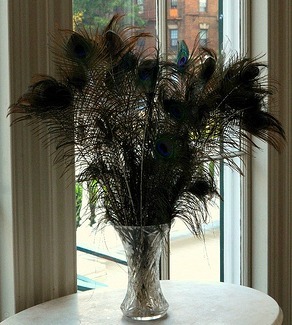 The first thing is work out the style of centerpiece you want, tall decorations can be made with tall vases, branches, peacock feathers or balloons. When you know the answer you need to find the base for your centerpiece cheaply. You can find great cheap tall vases on Ebay and often you will find a seller with lots of identical vases that would be perfect for your wedding. 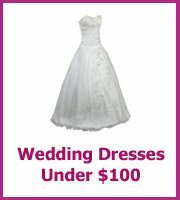 A number of brides do resell their vases after their wedding so it is also worth checking places like Craigslist, Gumtree and also wedding forums. Another brilliant place for cheap vases are dollar stores, if you see ones that you like buy them on the day as it is unlikely they will be there the next time you visit. Your vases can be filled with colored stones, fruit, peacock feathers and of course flowers and grasses. It could be a large cylinder vase filled with lemons and oranges for a Spring or Summer wedding. And tall Eiffel vases are great for grasses, flowers and peacock feathers as they are narrower at the top of the vase so you don't need as many. Fill your vase with ivy or grasses and then use the expensive flowers as a touch of glamour and color to your tall wedding centerpiece. In other words you don't have to fill your vases with flowers to make them look good. Branches are free, all you need are pots and some clay to secure the branches and then spray and decorate. This looks great for a winter wedding and you could even hang Christmas baubles in your colors on the branches. This idea also works for other times of the year you could have mini photos of each of your guests on each branch or photos of the two of you. I love the idea of using old family wedding photos at each table showing the two families together and also sharing the love that weddings bring. Candy and chocolates could also work as the decorations as long as you don't mind if they get eaten half way through the wedding reception! Flowers can also be attached to the branches using mini hanging vases, and these vases can also be used for tealights too. Just be sure they are safe before you light them. Balloons also make fun tall centerpieces, and you can make them yourself. Balloons don't have to look tacky or too much like a children's party, if you go with the very round balloons rather than the normal shaped balloons you will see what I mean. Keep the colors to two maximum and white only if you want more of a classy look. 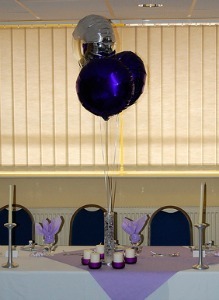 If your reception is in the evening you can even buy LED lights to go in the balloons for an added sparkle. You will need to hire a balloon gas cannister, balloons, ribbon and something to weight them down. Blow up your balloons and then tie the ribbon, when you have enough for one table, arrange the balloons at various heights and then secure the weight to them. The weight will keep them in place at the table. 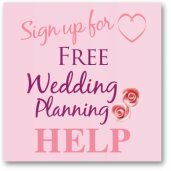 You can have your balloons to match your wedding colors and co-ordinate the ribbon. 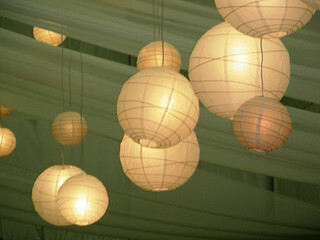 Paper lanterns have become more popular than balloons for wedding decorations. Unfortunately these don't stand up by themselves! However rather than having a high centerpiece you could have the paper lanterns hanging down from the ceiling to create a similiar look. The lanterns may cost more than a balloon but you don't have to hire the gas cannister to blow them up! Plus you can buy them with lights which would mean you wouldn't need candles in the evening either. 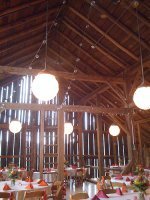 Worth checking with your venue that you will be able to attach the strings to the ceiling for your lanterns before you decide on this centerpiece! When you do design your tall centerpiece it is really important that you are aware of your guests and don't block their view of other guests or of the top table. You don't want your guests placing these lovely centerpieces on the floor so that they can see! 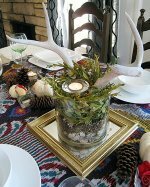 One way to check is when you make your mock up of the centerpiece place it on a table and then sit at a chair at the table and make sure you are not too distracted by the size of the centerpiece. 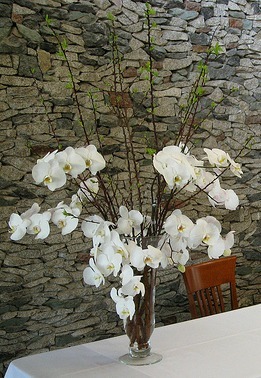 Also think about the whole centerpiece and try and create interest at all height levels. In other words you don't want all of the action of the centerpiece on the top of the vase and then none anywhere else. Maybe add colored pebbles to the base or have a flower submerged in the vase as well, this will give you color throughout the height. You don't have to have a tall centerpiece at every table you could alternate between a high and then a low at each table. Keep the centerpieces similar by having the same flowers or colors or themes.